Quarterly Report on Unknown Air Activity - Page 1. Quarterly Report on Air Activity - Page 2. Appendix A - Page 1 of 4. 8 Aug - XE 5 originated in 3 Sector and was carried for 2 minutes. It was then passed to 1 Sector who identified the track by a revised flight plan. This track was counted as a remaining unknown for 3 Sector only. 25 Jul - UA 2 originated in 1 Sector and was carried for 7 minutes. 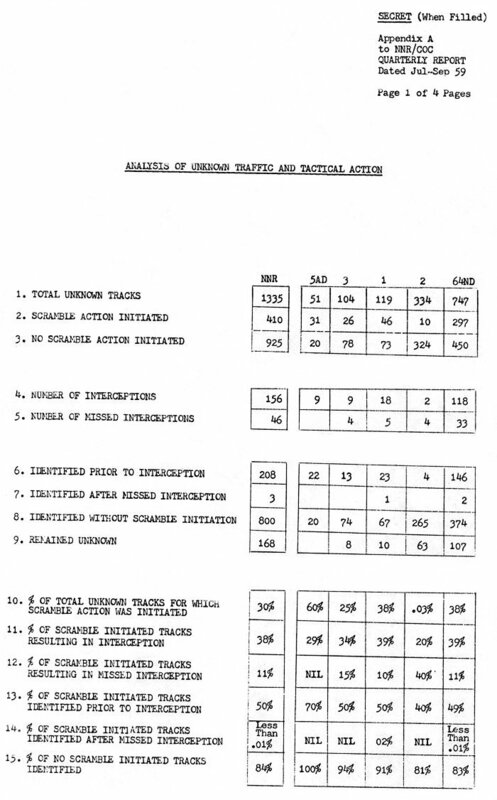 It was then passed to 3 Sector who identified the track by interception. This track was counted as a remaining unknown for 1 Sector only. 31 Aug - UK 42 originated in 1 Sector where the track was carried for 1 minute. The track was then passed to 3 Sector who identified the track via flight plan revision. The track was counted as a remaining unknown for 1 Sector only. 08 Jul - YC 31 originated in 64 ND as a friendly track. It was then "passed" to 2 Sector where it was reclassified "unknown". 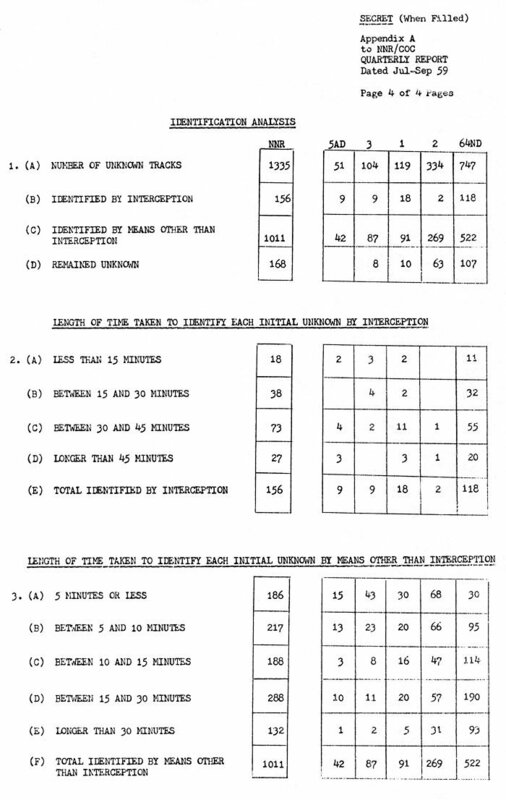 The track was carried in 2 Sector for 31 minutes and subsequently passed to 1 Sector, where it was identified friendly by revised flight plan information. This track was counted as a remaining unknown for 2 Sector only. 08 Jul - TG 48 originated in 2 Sector and was carried for 32 minutes. 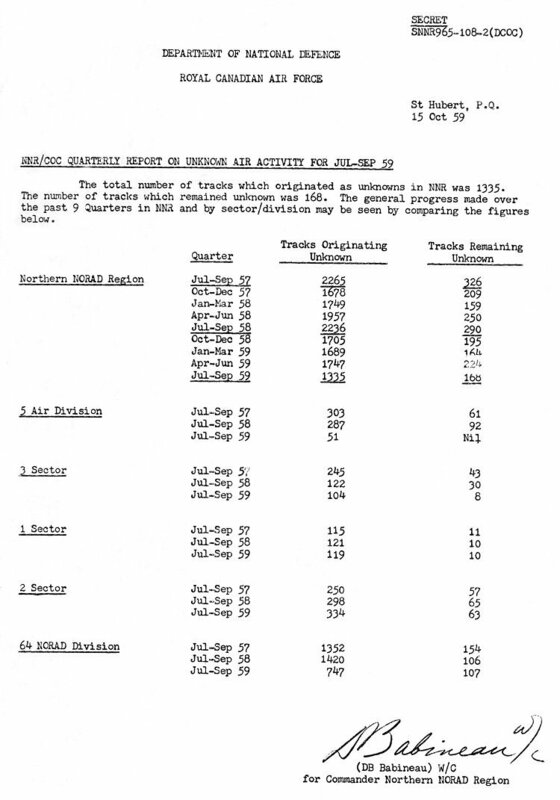 It was then passed to 1 Sector who identified the track by revised flight plan information. This track was counted as a remaining unknown for 2 Sector only. 16 Jul - TG 82 originated in 2 Sector and was carried for 7 minutes. 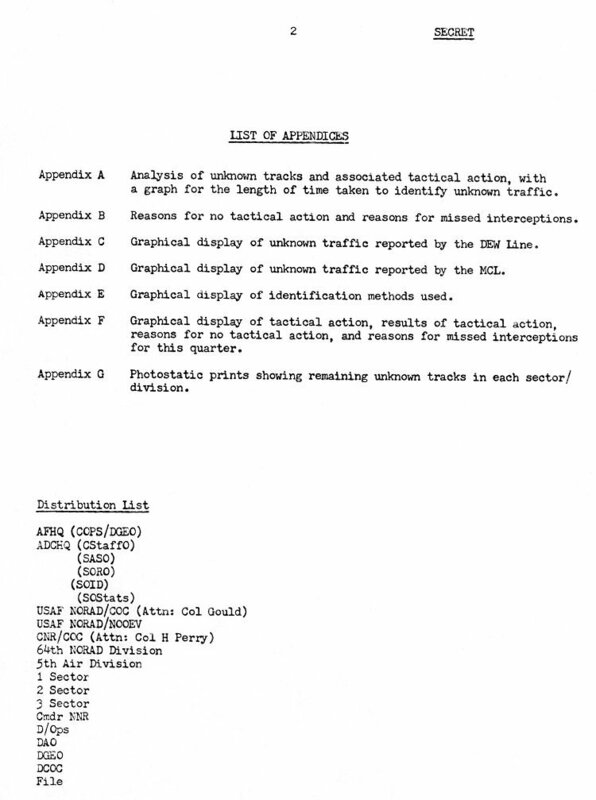 It was then passed to 1 Sector and identified by interception. This track was recorded as a remaining unknown for 2 Sector only. 08 Aug - TG 50 originated in 2 Sector and was carried for 45 minutes. It was then passed to 1 Sector who identified it by interception. This track was recorded as a remaining unknown for 2 Sector only. 21 Aug - TG 97 originated in 2 Sector and was carried for 18 minutes. It was then passed to 1 Sector where it faded prior to intercept. This track was recorded as a remaining unknown for 2 and 1 Sectors but as only 1 remaining unknown for NNR. 10 Sep - TG 9 originated in 2 Sector and was carried for 14 minutes. This track was then passed to 1 Sector where it was identified by late flight plan. This track was recorded as a remaining unknown for 2 Sector only. 18 Sep - TG 49 originated in 2 Sector and was carried for 11 minutes. It was then passed to 64 ND and carried for 15 minutes, fading prior to interception. This track was recorded as remaining unknown for 2 Sector and 64 ND, but only as 1 remaining unknown for NNR. 09 Jul - YB 67 originated in 64 ND and was carried for 11 minutes. It was then passed to 2 Sector. Identification was made visually by a qualified observer. The track was recorded as a remaining unknown for 64 ND only. 12 Jul - YC 55 originated in 64 ND and was carried for 3 minutes. It was then passed to 2 Sector who identified the track via late flight plan. This track was recorded as a remaining unknown for 64 ND only. 12 Jul - YB 15 originated in 64 ND and was carried for 43 minutes. It was then passed to 2 Sector who identified the track via late flight plan. This track was recorded as a remaining unknown for 64 ND only. 14 Jul - YB 87 originated in 64 ND and was carried for 17 minutes. It was then passed to 2 Sector who identified it by flight plan revision. This track was recorded as a remaining unknown for 64 ND only. 20 Jul - YB 74 originated in 64 ND and was carried for 1 minute. It was then passed to 2 Sector and carried for 7 minutes. Identification could not be established. This track was recorded as a remaining unknown for 64 ND and 2 Sector, but only as 1 remaining unknown for NNR. 25 Jul – YD 5 originated in 64 ND and was carried for 17 minutes. It was then passed to 2 Sector who identified it by flight plan revision. This track was recorded as a remaining unknown in 64 ND only. 26 Jul - YB 87 originated in 64 ND and was carried for 32 minutes. It was then passed to 2 Sector who carried the track for 27 minutes. Identification could not be established. This track was recorded as a remaining unknown for 64 ND and 2 Sector, but only as 1 remaining unknown for NNR. 28 Aug – YB 27 originated in 64 ND and was carried for 9 minutes. It was then passed to 2 Sector who identified the track by a late flight plan. This track was recorded as a remaining unknown in 64 ND only. 28 Aug – YB 53 originated in 64 ND and was carried for 7 minutes. 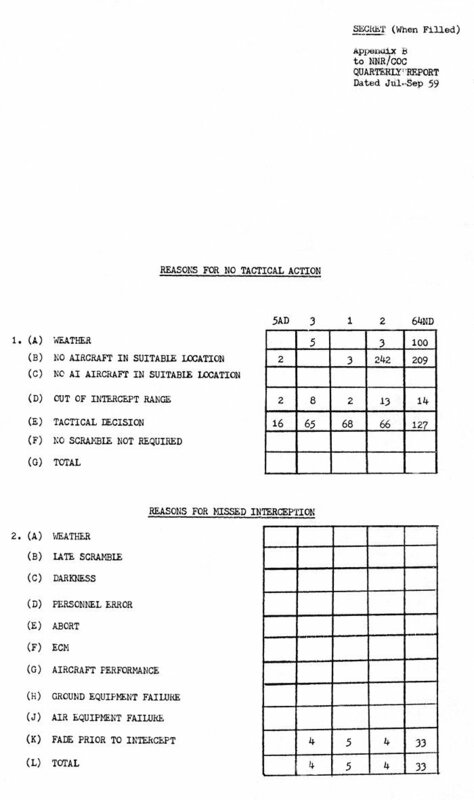 It was then passed to 2 Sector who identified if by revised flight plan. This track was recorded as a remaining unknown in 64 ND only. 12 Sep – YB 24 originated in 64 ND and was carried for 38 minutes. It was then passed to 2 Sector. The track was identified visually be a qualified observer. This track was recorded as a remaining unknown in 64 ND only. Appendix A - Page 4 of 4.